Today Wittians embarked on an excursion to the Dynamic city of Utrecht in Netherlands. Utrecht is almost 2,000 years old; and was founded in 48 AD by the Romans. For centuries, Utrecht was the largest and only city of importance in the northern part of the Netherlands. This was also a day of a double exchange ! Students from the Lyngby school Denmark arrived the previous evening for an exchange week with RSG Broklede. So the Wittians would now get to interact with both the Danish and the Dutch students and that would be a once in a life time experience. Wittians reported to school with the host children all set for a day trip to Utrecht . It was a 25 minute scenic drive through the freeway to Utrecht. They passed the 350 year old University of Utrecht to assemble at the Dom Tower which is at the center of the city. The Dom Tower offered an excellent view of Utrecht and the surrounding area. All the children had their lunch there and then the Wittians and the Danish children with their respective Dutch hosts left on a treasure hunt . The treasure hunt began from the herb garden of the medical college. Students divided into groups of four. Each group was given a list of clues written in Dutch and the Dutch students had to translate the clues for the Wittians and work their way together in the treasure hunt. Wittians along with the Dutch students applied their mind at deciphering the clues .Each clue led to an alley or a lane of Utrecht. During the treasure hunt students saw centuries-old churches, canals, yards, almshouses, gardens and historic monuments. Students also visited the cathedral and were amazed by the French Gothic style, 15th century wall paintings and medieval courtyard. 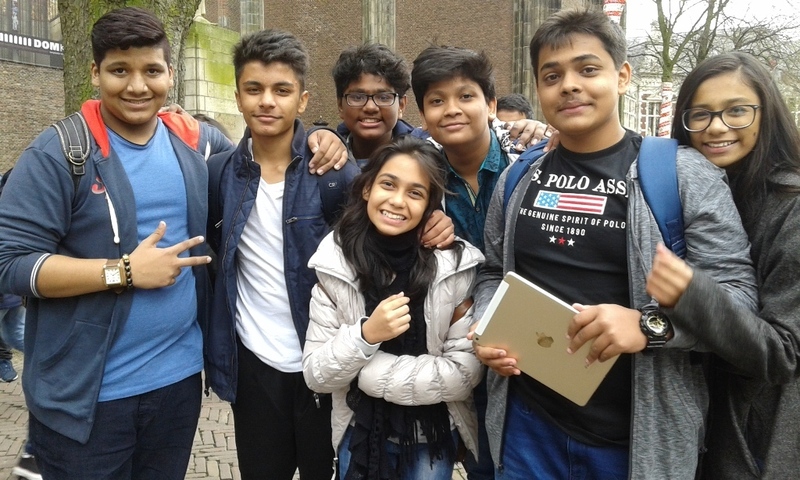 The brilliantly designed treasure hunt was a wonderful way of exploring the quaint city and soaking in the culture and history of the beautiful city of Utrecht. Wittians enjoyed the experience thoroughly and took back with them a great deal of rich Dutch culture and heritage.